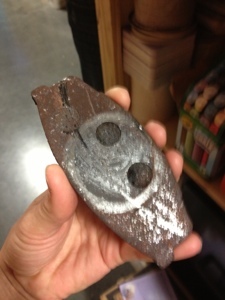 My wife found this brake pad in the parking lot of her work, someone waited too long. We are continuing in our car service series. This week I want to talk about the brake job. There are a lot of variables that go into making a choice on replacing brakes. It is not always a cut and dry choice. Let’s first break down the common types of brake jobs. Then I will give you some advice on deciding if you need to perform a brake job your car. This is only replacing the brake pads. This is generally the cheapest way to do a brake job. We call this “pad slapping” the car. I do not prefer this type of brake job. It is not a bad thing. I just think you can do a more thorough job. This brake job is where we replace the brake pads and the rotors(duh?). This is a much better brake job than just replacing the pads. Replacing the rotors will give the pads a fresh surface to seat. It can also help reduce brake noise. The only issue here is, rotors can be expensive. This is the way I prefer to do a brake job. With this type of brake job I replace the brake pads. But instead of replacing the rotors, I resurface them. That is where I put the on a machine called a brake lathe. Then we remove a very small amount of metal from the rotor. It makes for a nice clean surface. This is also called turning, or cutting the rotors. There are times where resurfacing the rotors is not an option. Like I said, resurfacing the rotors and replacing the pads. It is a better overall brake job, and cheaper than replacing the rotors. Like most car repairs, the longer you wait, the more it can cost. If you wait to long, the rivets in the pad will impact the rotor. That may mean resurfacing the rotor is not an option. The rotors will have to be replaced. In extreme cases more damage can occur. I have seen calipers, the part that pushes the pad in to the rotor, be destroyed. The thinner the pad gets, the further the caliper pushes the pad. At some point the caliper will over extend and fail. This is not only very costly, but VERY dangerous. Remember when dealing with brakes, safety is always a big concern. How do I know if I need the service? On many modern cars we have a warning system. There are warning lights to tell us when the pads are getting thin and need to be replaced. Some cars have “squealers”, that is a small strip of metal that will hit the rotor when the pad gets thin. It causes a really loud and obnoxious squeal. While these warning systems are a good thing, I don’t rely on them. Most cars only have warning lights that monitor the front brakes. That leaves the rear brakes unmonitored. The squealer warning works great. That is until the customer says something like “My brakes have been making a noise for about a year now”. Trust me, that stuff happens. The right way to check the brakes is to remove the wheels and do an inspection. Some wheels allow you to see the brakes pretty clearly. Taking the wheels off is the best way to check the system. Here are some of the things you want to check. Thickness of the pads. Be sure to check the outside and the inside pads. Many cars will wear the inside faster than the outside. Look at the rotor. Check it for grooves like a record would have. Look at the color, if it is turning blue, you may have an issue. Also look at the edges, if there is a big lip on the outer or inner part of the rotor, you may have to replace them. Turning the rotor too thin will cause a brake vibration. Make sure there is no leaks. So, do I really need this service? You may not actually need this service. VW says that the minimum thickness is 2mm for the brake pads. That is really thin. I would not want to let my brakes get that low. If you do your own brake inspections, you have to use your best judgement. If your mechanic is recommending that you get a brake job, here are the things you need to ask. How much pad is left? This will give you an idea of how thin the pads really are. Plus it will give you some confidence that he actually measured them. Will them make it to the next service? This is the big one. That question should tell you if you need to do it today, or if it can wait. One other piece of advice. If you are on the fence, get the brakes done. Please don’t mess around with the system keeping you from crashing in to another car. When I recommend brakes I use the “will they make it to the next service” rule. Either way, I tell the customer. If I don’t think it will make it, I will let them know. If you are interested in some of the other “Does my car really need this service” posts, you can check them out here. 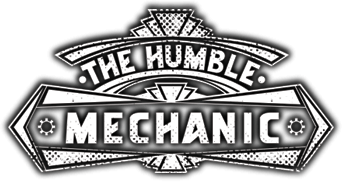 Does my car really need a timing belt service? Does my car really need an oil change? Does my car really need a brake fluid service? Does my car really need a coolant flush? If there is a service you want to know more about, post it in the comments, or just contact me. With the pad laying on the parking lot, I have used old thin brake pads to put under the kick stand of my motorcycle to keep it from sinking into the parking lot. I also thought it was cool when I was a kid to watch brake rotors being turned. You resurface at the dealer level? What kind of brake lathe do you use? I never seen a vw rotor cut well everyone I don’t or seen done works good temporarily than ends up with alot of run out. I personally don’t resurface or pad slap at all any more I can get rotors to cheap for that. FYI Passat oil pump is replaced pick up tube was 98% clogged. 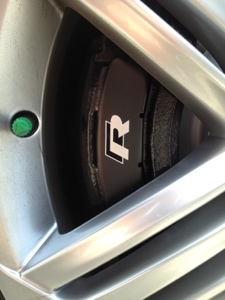 We resurface rotors all the time. I don’t take more than .2mm off each side of the rotor. I have cut tons of rotors and not had any issues. Of course I won’t cut them if they are badly warped. I want to make sure they have enough rotor meat for the life of the new pads I install. HA, a Passat with a clogged oil pick, pretty common. This article is very useful. Thanks for sharing it. I would want to add a video where they show very well how to replace the brake pads on your own. safety is so important, with brake pads it is probably best to be over cautious rather than taking risks to save a few bucks, especially in the winter months and harsher driving conditions.